Recent volatility in the stock market has been difficult to anticipate, but whether you're a Bull or Bear, there's never been a better time to take control of your financial future. 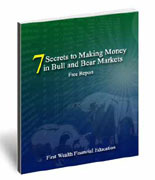 We'll deliver our report "7 Secrets to Making Money in Bull and Bear Markets" straight to your inbox, FREE of charge, with no further obligation. Enter your name and email address in the box below and we’ll email your FREE copy. You must confirm your email address after you submit. Check your email for instructions.